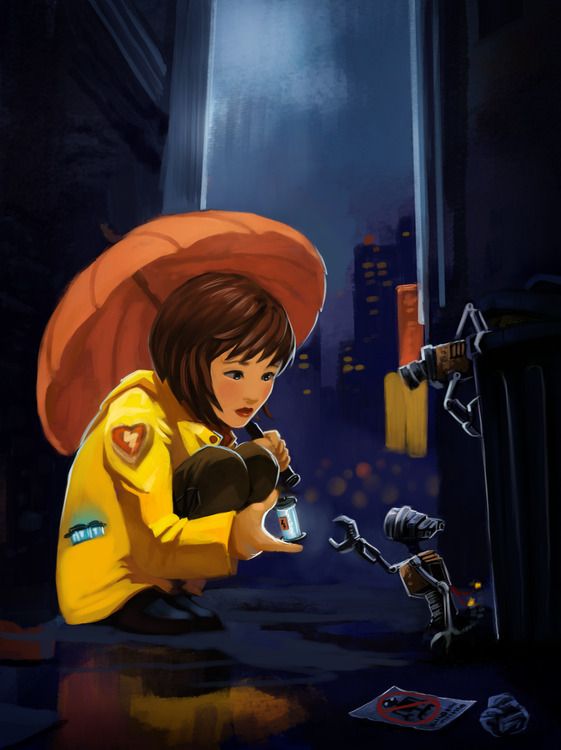 A Sci-fi illustration about a little girl distributing power battery to abandoned little robot. 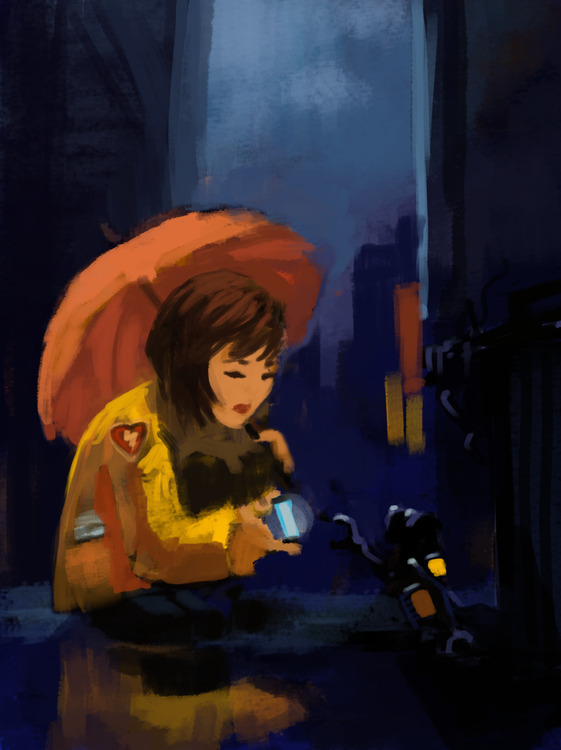 I wanted to paint a mix of a lot of things I'm not used to paint ; a kind of a colorful Bladerunner universe with sweet design as in Miyasaki movie or Pixar ones. update 2016-07-25: This illustration is now licensed under CC-By 4.0. License: CC-BY David Revoy, www.davidrevoy.com, 19 august 2010 . I have been following your blog lately and have become a devotee of MyPaint. It's great you are showing your illustrations in a step by step format. It's great to see your process. That's absolutely beautiful and more than a bit inspirational. I have no words, I just love it! I love your style and all your paintings. Beautiful work. Ben, ouais, j'aime aussi !!! La petite fille me rappelle étrangement une jeune polonaise que j'aime beaucoup, quelle chose étrange !!! aww. homeless robots. kinda reverse matchstick girl. Anywhere I can get a print of this? @All : Thanks a lot ! @Ethan : I didn't have a "poster/print" service yet. Did someone have a good one to advice me ? I tried 'Inprnt' but it seams I have to go throught complex validation process to submit an artwork. @Kieren : Woao, that's a nice poem about it. Thanks to submit it , can I use it or illustrate it ? Kieren, nice work. 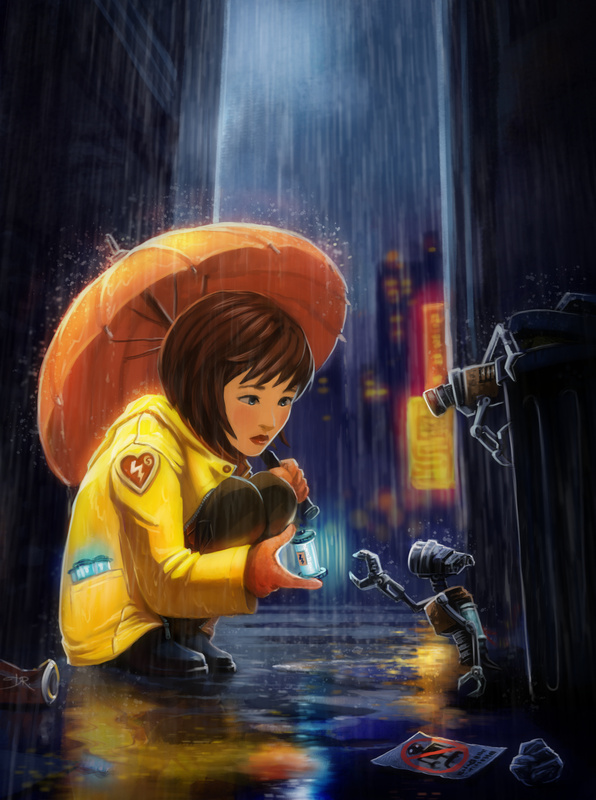 Beautiful imagery and story line poignantly enhancing this wonderful illustration. You've got a gift. I wonder how much time did it take to no need to use construction lines ? 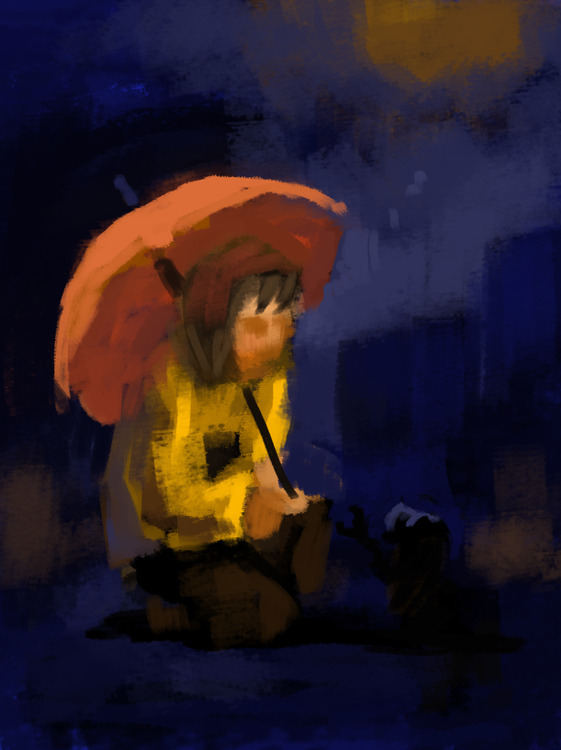 This looks more like Mypaint made and "post pro" in gimp :) , looks like a water colors painting. BTW: Nice signature on the soda can. :) Good ideea for a short. @Droptop: I agree ;) I would start working on it if Kieren come back to give me the authorization. very nice picture! a great idea, I think! How about deviantart for posters? Publishing a calendar on lulu.com would not be bad either! @Énio Fernandes : Hey thanks for the tips ;) I will study it too. ; You are right : I should propose the wildest choice of shops for posters and goodies. I will work on it soon. She's pretty basic, and those robots are acidic. Thanks matthew for sharing your opinion. Don't hesitate to send me links here of not basic girls and cool robots, I always like to watch good stuff for various opinion. Makes me want to cry. Wonderful. Lovely. I have no words to describe this image. Congratulations! Beautiful and with great future social commentary. There is just one logical problem with this picture that was perhaps not thought through: How does a robot change its own battery without deactivating itself? I can't help but notice, however, that she seems to have some slight proportional issues. She's a little girl, yet has the head (and makeup) and feet of a grown woman, not to mention her head and feet are much larger than you would expect compared to the rest of her body. Following the lines of her legs to her feet, they don't seem to match up with where her hips and back would be, but this could be due to the coat being so short that the pocket is higher than her elbow and tricks the eye. This is just my 2 cents, I'm no professional so you can disregard my observations, I'd just feel dishonest for not pointing these things out. I am SO writing a fanfiction of this. This is beautiful. This is really awesome. The colors are great! Great art, but the english needs work. I see a concept here. An open movie project, perhaps? Time to get to work...with permission, of course. That said, I need to get this on my wall! The high-res is on deviantArt ( link in the article ) you can put the file on a USB stick and go to a local printer ( even sometime photocopy center have good A3 or A2 color printers ). Always best to get the permission at all costs. Will keep you posted! Will this print to A1?